Produced by Joyce Follet and Terry Kay Rockefeller. Editor and Videographer Rawn Fulton. Sophia Smith College, Northampton, MA, 2001. 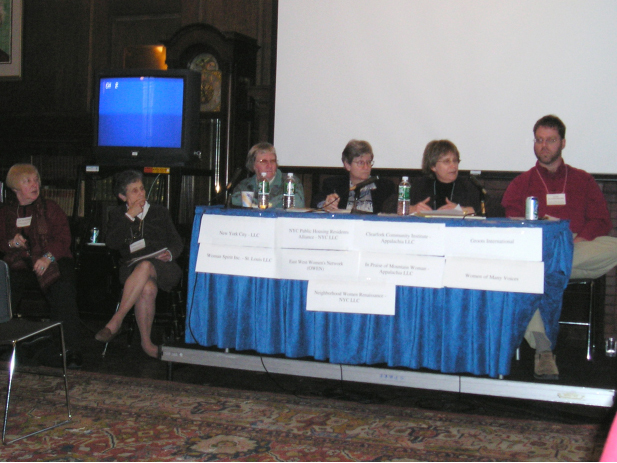 On February 19, 2004, The Kathleen Rider Conference at Smith College served as the culminating activity of the project: Neighborhood Women: Sharing Community Strategies Globally. This project had as overall purpose to empower the communities and to further build social movements. 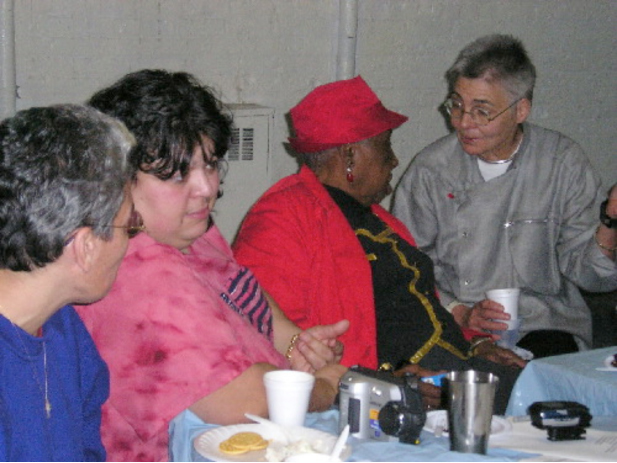 From June 2003 to Februrary 2004, the three Living Learning Centers – in Tennessee, New York and St. Louis – and grassroots women’s organizations in other countries, met regularly to have reflective sessions on the strategies and experiences they wanted to share with one another. 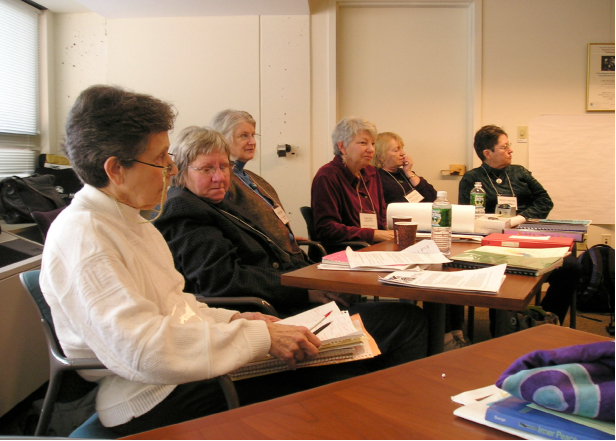 Neighborhood Women also held two national meetings, or peer exchanges, in St. Louis and Tennessee, where participants shared experiences and discussed the issues they confront in their communities. 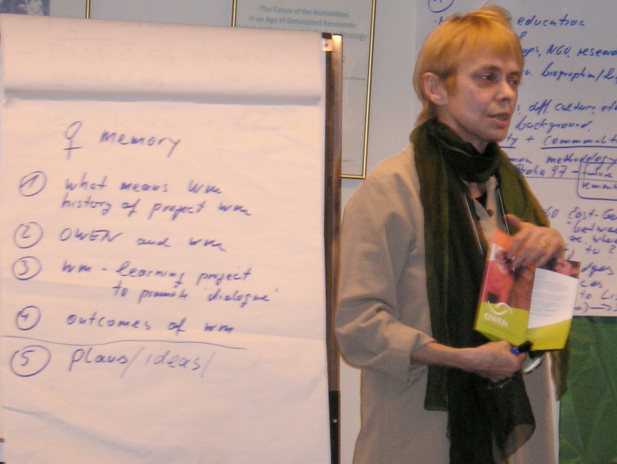 In addition to reflecting on their local practices, participants reflected on the knowledge gained from relationships with grassroots women’s groups abroad over time and continued the international dialogue as a component of the Sharing Strategies project. GROOTS International gave support to this project, and the international exchange was carried out through the Groots network. The Kathleen Rider Conference gathered thirty grassroots women leaders from the National Congress of Neighborhood Women to review the project and NCNW’s strategy sharing work. Organizations from three low-income communities across the U.S. came together to share the information and knowledge they have accumulated over their years of community work. Appalachia, TN: The Clearfork Community Institute . New York City (low-income neighborhoods): Neighborhood Women Renaissance Houses, The New York City Public Housing Residents Alliance and The Fifth Avenue Committee. 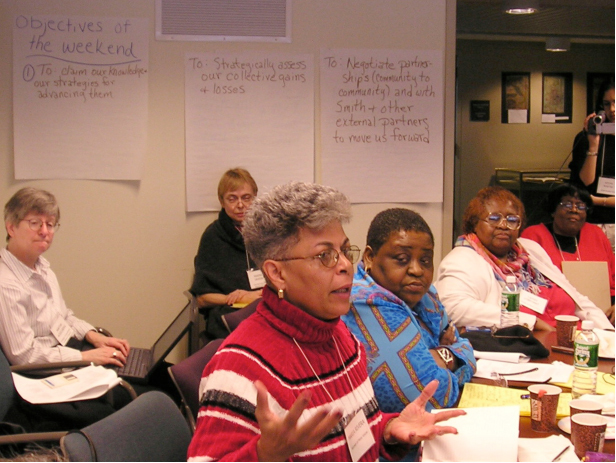 St. Louis, MO: Woman Spirit, Inc.
All participating organizations have been linking themes in their own community-development work to global policy-making debates and agreement-setting processes for the past five to seven years. Each community brings a variety of partnerships with universities, faith-based institutions, corporations, and others. The following reflections on the history of NCNW come from panel discussions and a public keynote address by Jan Peterson. ‘In order to assess the gains and losses of Neighborhood Women, and to harvest the lessons learned, participants spent substantial time reviewing its history. We reflected on how we came together as a national network, the obstacles we faced and the strategies we used to overcome them. We also took a look at our regrets from over the years and thought about ways to move forward into the future. In the 1970s anti-poverty movement, many of us were active community members creating daycare centers and housing programs. Our national network was started with a conference in Washington, D.C. in 1975. There were not any intentions of following up after the conference, but some of us who participated in it felt there was a need for such a network to continue, so we took it on. We took people from different movements and brought them together in a network of women who were doing on the ground work, on the local level – women who didn’t have to leave their family and racial and class identity to make a difference. There was a conflict between the Women’s Movement and us, but the difference was place – what it means to act local. In the early 1980s, people started meeting with one another as funding disappeared under Reagan and oppressive forces reared their heads. We looked to women such as Bertha Gilkey opposing these forces in St. Louis. She led her community in preventing public housing from being torn down. The community said, “before you tear them down, let us have a chance at running the buildings.” Residents were playing a role in their communities, but in the late 80s, the problems of the communities tended to be blamed on the community members themselves; government began to use welfare more of a punishment than a support. The NCNW office was based in Williamsburg, Brooklyn. One of the successful strategies that Neighborhood Women developed was our annual Institute on Women and Community Development, where women from groups across the country could come together to learn new skills and share their experiences. The other major strategy that was unique to Neighborhood Women was the Leadership Support Process, discussed in a later section of this report. What’s a lesson you learned the hard way? LaDoris Payne: The importance of relationships – group to group relations and international relations. Marie Cirillo: When you become a leader, your personality affects others in your community. Learning how to build your space and pay for the programs you’re building. Maria Rivera-Brown: How to sustain the support group process. We burnt ourselves up in the campaign process when members ran for city council, and women have to let go of something in trying to keep everything together, so we let go of the support group process. But, then you become sick. When Lisel Burns joined other members of Neighborhood Women to develop the Leadership Support Process, they did so out of a need. 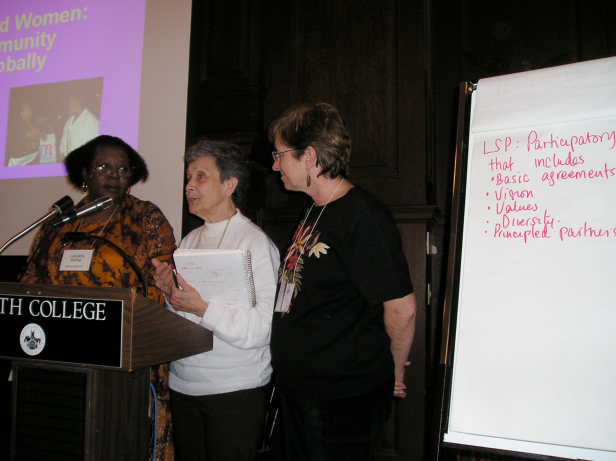 Neighborhood Women was facing conflicts between members in the organization because of the racial, ethnic and class differences among them, so they designed the LSP as a strategy to overcome these difficulties. The LSP ended up serving many other needs as well. This practice has become one of the crucial common threads through which the local groups continue to relate. The LSP reminds members of a shared organizational culture and a shared need for personal support as both developing and seasoned leaders. What were the problems that the LSP strategy helped to overcome? Coming together across ethnic and racial groups was a challenge. Women who do all the work to hold communities together need support! Needed to build solidarity among women organizing together, so they wouldn’t just go back and forth between fighting or being nice to one another. They needed to understand one another well enough to engage in real debate. Meetings needed to be more effective. The Leadership Support Process gives women an opportunity to find their voice by laying out a strict meeting style that gives everyone an equal opportunity to speak. There is a very real listening that participants do for one another, and they also ask one another “vision questions” to encourage them to think of new ideas and articulate their dreams. The LSP creates less fragmenting of people and more community strength. It brings women together to support one another, listen in a meaningful way, and overcome isolation and pain through support and appreciation of one another. In addition to giving one another support, each participant is making time for herself by participating. She comes closer to curing what Rosemary Jackson-Smith, from Camden, calls the “Human Service Disease”, when we work so hard that we don’t have time for ourselves. With the kind of support that women give one another in the LSP support groups, women have the opportunity to further explore their own thoughts, beliefs and skills sets. When they have done that exploration, they can give voice to their thoughts and knowledge. Carol Judy told us that “Neighborhood Women gave me a voice to talk.” At Neighborhood Women, women used words and language that enabled her to give voice to her knowledge of nature, agriculture, or community relationships. The knowledge was there, but women weren’t always able to claim it until the Leadership Support Process helped them to find their voice. Neighborhood Women have implemented the LSP into the meetings of their immediate organizations as well as broader groups with which they work. LaDoris Payne said that in Woman Spirit, they use the process to help facilitate discussions. They support, educate, and create a plan of action after each meeting, and the process caught on throughout the community. In New York City public housing, Ethel Velez says they have used the process in the immediate community of her housing development and tenants’ association. It helps them to “function,” and over a period of twenty years they have completed their wish to function better. “The biggest part is respecting one another in our meetings,” Ethel emphasized. They are now working on using the LSP in the city-wide Residents Alliance. In Camden, Rosemary Jackson-Smith recalled using the process in a community meeting to discuss the high level of violence in the community. The tension was high, and everyone was ready to lash out at one another. She went up in front of the police, students, parents, and community people, and she saw the potential for things to really go badly, so she put up a list of Basic Agreements – one speaker at a time, only speak for yourself – and it worked! During the Smith conference itself, Neighborhood Women utilized the Leadership Support Process by giving time in the large group discussion for personal sharing. We also convened in smaller LSP groups for a more intensive session of leadership support, and participants personally supported one another in traditional LSP ways throughout the weekend. Participants at Smithh strongly reaffirmed LSP as a process that has enabled them to gain a voice, carry out effective meetings and therefore claim what they know and what they do as “knowledge.” To take the claiming of knowledge further by sharing both the knowledge and the process with other grassroots women, students, development workers or political actors through Living Learning Centers is the next step. And as we move forward with our knowledge, we must continue to practice and spread the Leadership Support Process. Peer Exchange: A meeting or conference in which peers from different grassroots organizations visit each other’s community, in order to share experiences, skills and knowledge. Over a period of several years, Woman Spirit did exchanges with women’s organizations from Germany, Zimbabwe, Kenya, Russia, Thailand, Brazil and Ireland. Doing this international exchange gave visibility and called media attention to Woman Spirit’s local work. In New York a few years ago, women hosted groups visiting the United Nations to see local community work. They took the groups to East Harlem to see the work of the James Weldon Johnson Houses Tenant Association, of which Ethel Velez is President. In the Sharing Strategies project, the New York City group thought about organizations in the Groots network and other organizations that work on issues of housing, as the New York groups do. On behalf of the group, Dahlia Goldenberg reached out to 5-6 groups by email, faxing and calling. The exchange got off to a slow but good start. They have begun communicating with Estrategia in Peru, which is building housing, Kenya and the Center for Equality Rights in Canada. Celeste Staton told us that she was very impressed with the story we received by e-mail from Estrategia / Concremat, the women’s organization in Peru. She commented that, “They got training, they started to build their housing, the bricks, all of that. And it was all participatory, and I said, ‘well daggone!’ If they can do all this . . . That was so impressive to me! For the final public session, Martha Ackelsburg organized a panel with us on partnerships. The panel consisted of women from NCNW and local faculty from Smith College and Hampshire College. From NCNW, Carol Judy, Marie Cirillo, LaDoris Payne, Maria Rivera-Brown, Ethel Velez and Jan Peterson spoke. 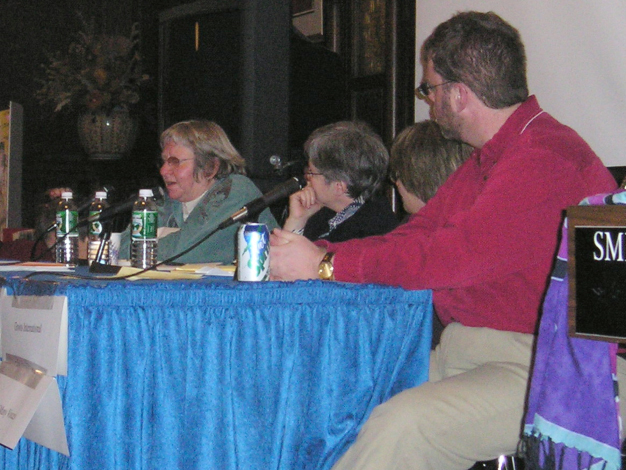 Myrna Breitbart from the School of Social Sciences at Hampshire College, Alan Bloomgarden from the Office of Advancement and Community-College Relations Coordinator at Smith College and Martha Ackelsburg, professor at Smith College represented the faculty. The dialogue brought grassroots women and faculty together in order to explore an idea of how academic institutions and community based organizations in general can work better, and to develop an idea for a continuing the specific relationship between NCNW, Smith College and other colleges in the valley. The panel began from a positive position – from our strengths and our best practices. This position contrasts with the tendency in literature for service-learning student volunteer programs to focus on “bad practices.” Faculty told of positive experiences in hosting conferences for community activists and planners and participating in conferences and trips to learn across culture. 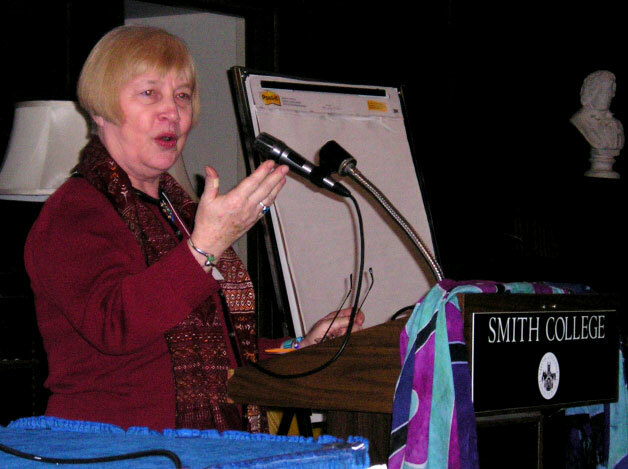 Myrna Breitbart emphasized starting from a common vision for social justice and citizenship. NCNW also spoke of ways they were able to “get what they needed” from colleges. LaDoris Payne and Ethel Velez from NCNW conveyed their positive experiences with universities helping with evaluation and research in their communities. LaDoris Payne explained how a local university paid for the Kenyan activist Wangari Maathai to travel to their community in St. Louis to make a presentation, and the visit benefited the local organization and grassroots women considerably. Marie Cirillo, from Appalachia, noted that they found a college to hire community people from Appalachia as consultants. Many of the panelists had encountered difficulties in crossing the cultural language and ways of working between academics / students and the communities. Community women stressed the knowledge their communities have to offer students and professors, and they spoke of their communities as “classrooms” that offer valuable skills, a cross-cultural experience and a real view of how poverty affects communities. Faculty and grassroots participants alike had experiences to tell of students who were insufficiently prepared or programs that function from a position of power and benefit from the resources of the community, while inadequately sharing their own resources. The audience also had diverse experiences to share as students, professors, administrators and community workers. 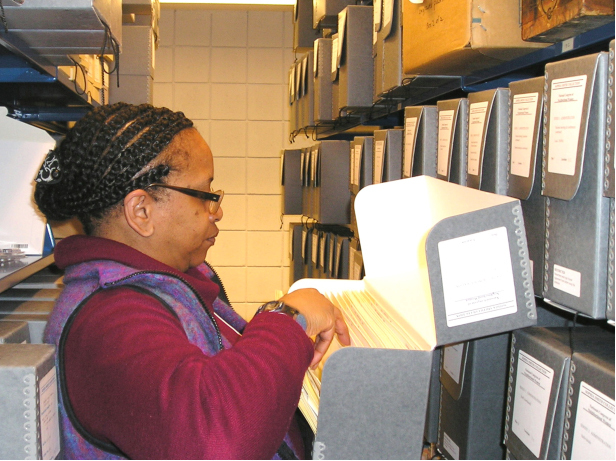 Smith College holds NCNW’s history in its archives, along with the archives of other individuals and organizations in the United States and abroad, from the colonial era to the present. This collection is called The Sophia Smith Collection. 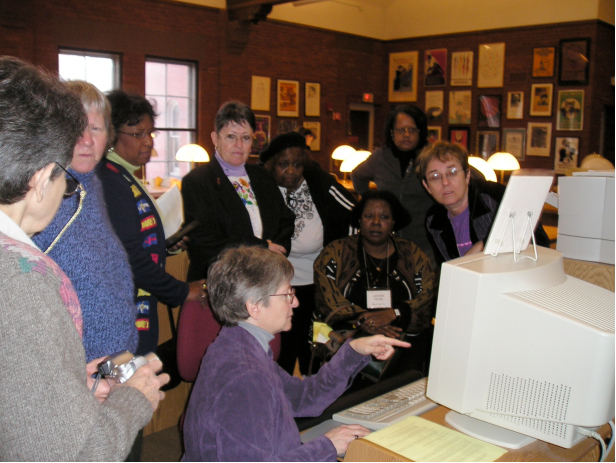 At the conference, NCNW members browsed the archives of the NCNW history that led to the work they continue to carry out. They sifted through boxes of documents generated from individual women: flyers, posters, proposals, meeting minutes, and photographs. From NCNW organizations: Ola Mae Bledsoe, Hattie Braddy, Dell Marie Brown, Lisel Burns, Marie Cirillo, Marion Colette, Diana Crone, Linda Duke, Dahlia Goldenberg, Marina Grasse, Suranjana Gupta, Marie Hatfield, Jennifer Hill, Rosemary Jackson Smith, Sister Mary Jude, Carol Judy, Anne Leibig, Elizabeth Marrero, Anne Miller, Geraldine Miller, Cathy O’Bryant, Peggy Partin, LaDoris Payne, Jan Peterson, Maria Rivera, Cora Santiago, Habiba Soudan, Celeste Staton, Ethel Velez. Smith student documentors: Neema Khatri,, Kathleen Hornby , Emma Roderick, Krystal Banzon, Shanna Burke, Candace Gibson, Beth Murphy, Rachel Sala, Amy Killelea, Marilu Gamboa.